With the start of November, Performance Today has put together a little autumnal gift to keep you warm, to help you enjoy the change of seasons and to offer a little music to cheer you as you start to spend more time indoors. 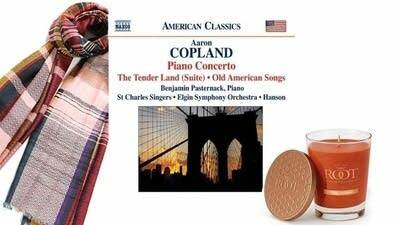 • A lovely CD of autumnal music by Aaron Copland. • A multicolored scarf to help you wrap up against the chill. • And a special candle for autumn with the aromas of sage, apple, oak and maple. We'll draw a name from the entries on Nov. 14. And don't forget to sign up for our newsletter so you never miss a great performance on Performance Today! Enter for a chance to win Performance Today's Autumn Giveaway. The winner will be drawn at random. Be sure to enter by 11:59 p.m. central on Wednesday, Nov. 14, 2018. And don't forget to sign up for the Performance Today newsletter when you enter so you never miss a great performance!